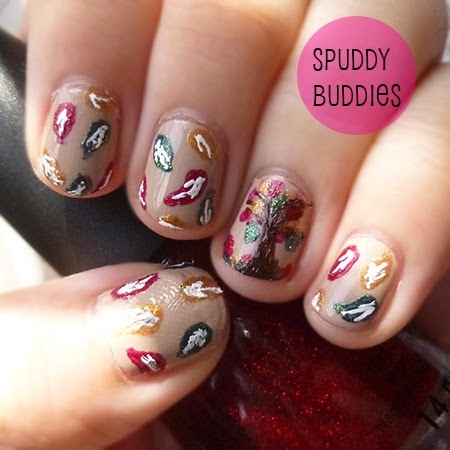 It's November and I've got awesome fall nail art for you today!! 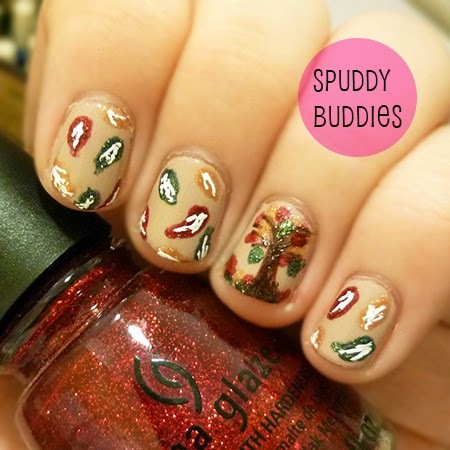 This nail art idea came from a random google search for fall nail art ideas. I really wasn't feeling most of them but then I saw a leaf design, which I'll show at the bottom of this post, and really liked it. I hope you'll like it as much as I do, especially the eggshell base color which I LOVE. Okay, the glittery leaves are also really pretty but I just love the base color. I haven't used it since last Christmas and I'm surprised it wasn't as gunky as I thought it would be when I broke it out to use. 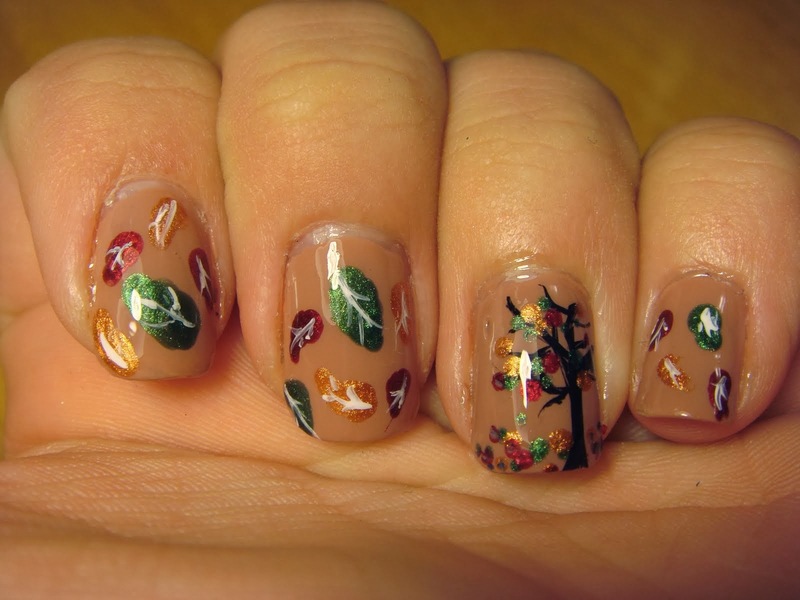 I used my handy nail art brush to draw the leaves and the tree. Don't you love how the tree turned out with all its eye-catching glitter leaves? Haha, yes, I'm aware that I've got quite a few nameless polishes. I sealed the design in with Sally Hansen - Insta Dri Top Coat. These are the nails I was inspired by. Clearly the white on the leaves are less obvious and look better that way but my nail art pen was spilling so I couldn't quite control the flow. 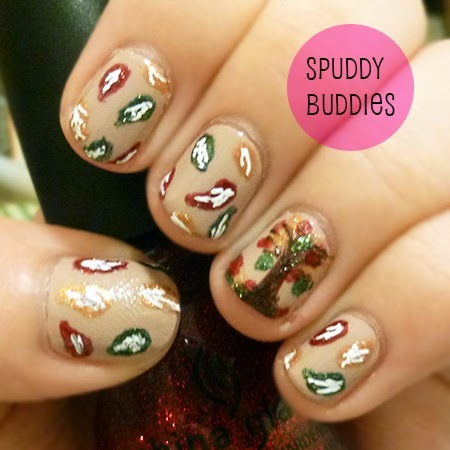 What do you think of my spin on the fall leaves nail art? To me, they turned out really pretty and I'm really glad I used glitter polishes for the leaves. Glitter is always fun and in designs like this, very festive. Show me some pictures of the fall foliage where you live! I'd love to see them. 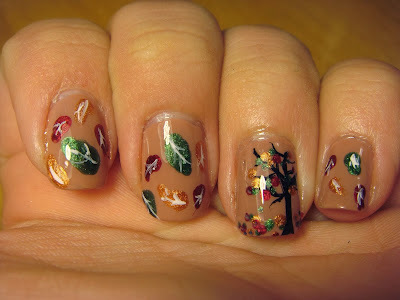 If you did nails based on fall foliage, send me the link! I don't think I have the artistic talent to every do nails like these- but I Love the eggshell base! Beautiful! 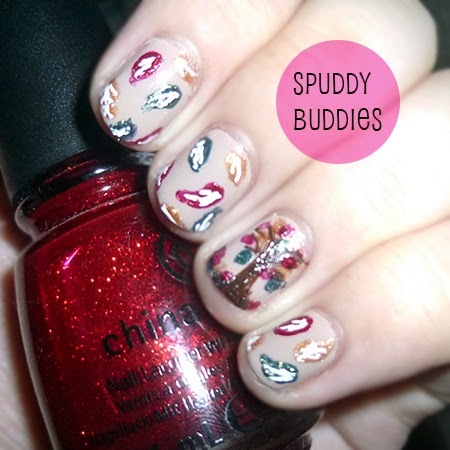 I love that you went with glittery leaves - really adds something special to the look! !